"The story of Kecak dance is about the Ramayana who fight Rahwana with the help from a bunch of monkeys. The dance-drama was originated from the dance ritual of Sang Hyang with the dancer entering the area in a state of unconsciousness. About 50 dancers perform this dance and they are dressed in tartan, unlike the Barong dancers are wearing a mask. Kecak dance is now afloat and become an icon in the artistic traditions of dance in Bali." The Uluwatu Temple is located on the cliff of Bali with a magnificent view over the Indian Ocean. 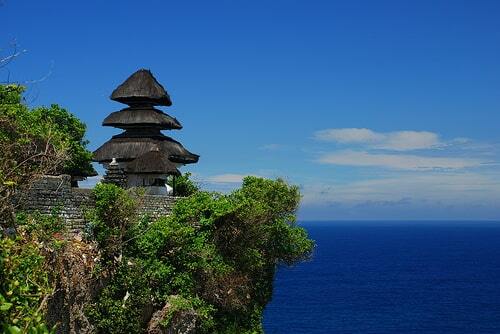 The temple was built in the 11th century and is situated about 80 meters above the sea. It is one of nine directional temples meant to protect Bali from evil spirits. 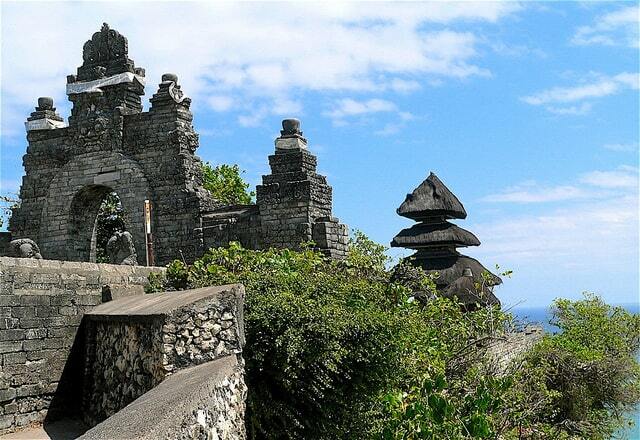 It is one of the most important sea temples in Bali. In particular, the reliefs on either side of the split gate are famous. These "wings" guard the temple. The second courtyard is Ganesha, the elephant god, to see. Here you can see the monkey dance (kecakdans) during the sunset. 'Protect' the monkeys in the temple dance. Part of the temple can not be accessed, only the Balinese with certain ceremonies. Bare legs are not allowed, so no shorts, or take a sarong with it. You can also rent. Guide is available. The temple is located right at the extreme southern tip of the island. The temple is built on a cliff, which is high above the water. From this point you can admire a beautiful sunset. Obviously, you must be dressed discreetly enter the temple. Therefore there at the entrance sarongs for rent. At this place you can see the famous monkey dance (kecakdans) during the sunset. 'Protect' the monkeys in the temple dance. The temple is located right at the extreme southern tip of the island. The temple is built on a cliff, which is high above the water. From this point you can admire a beautiful sunset. Obviously, you must be dressed discreetly enter the temple. Therefore there at the entrance sarongs for rent. The temple is inhabited by large number of monkeys, who are extremely adept at snatching visitors' belonging, including bags, cameras and eyeglasses. Keep a very close grip on all your belongings and stow away your eyeglasses if at all possible. If you do have something taken, the monkeys can usually be induced to exchange it for some fruit. Every night at 18:00 there is a Kecak performance (traditional version) in the amphitheater and the monkey dance takes about an hour. The dance was first performed in the thirties of the last century. The kecakdans is quite special to experience, it's touristy. The kecakdans is held every evening. After the dance, you can enjoy the beautiful sunset. Admission is Rp.70.000. At the entrance you can use the services of a guide, but there is no obligation. The chorus of men singing the words Cak ke-cak ke-cak ke-cak ke-cak ke-cak, in rhythm, time and time again. For this reason, the dance is then also called the Kecak or Cakdans. The Kecak dance consists of about fifty men, who dressed only in a loincloth, the upper part of their body is uncovered. They form rows of circles, in the middle is a coconut oil lamp. The Kecak dance is performed for dance-dramas and the story has to do with the Ramayana epic.